It was a beautiful sunny day as I made my way into Civic. There was a gentle breeze, but nothing overly concerning, however, there was a chill in the air. It was around 12:30pm when I arrived in Garema Place, and I was soon met by Ben and two other people who were out witnessing. Our plan for the day had been to preach to the lunch time crowds, however, we found that members from the Australian Communist Party and Socialist Alliance had taken over our normal preaching spot with the intention of holding an anti-government rally. Knowing full well that we couldn’t compete with the crowd we decided to instead infiltrate the crowd with the Gospel. At the side of the rally I set up our new Scripture sign so that all those who were at the rally or walking past would be able to read God’s Word, and from that point I was able to hand out some of our “Stop” tracts. Since the crowd was calling for the government to “STOP” these tracts went down like a treat. During the rally I was approached by a black man, he stopped and asked me to explain my Scripture sign. I informed him that this was a verse from God’s Word, and it told us why we need the Saviour. He said that he was a Christian from South Sudan and he’d never heard of John 3:16 before. I asked Rtuk to explain his background and as he did I found the reason he’d never heard God’s Word before. It turns out that Rtuk was not a Christian, but rather a strict Roman Catholic who did everything that his priest told him. I was able to share the message of salvation with Rtuk and he took a tract that shows the errors of the Papist religion. By now the rally was beginning to finish up, so I made my way to our normal preaching spot and set up the Scripture sign right in the middle of the dispersing crowd. It was during this time that I noticed Ben was looked in a good discussion with a lady from the rally. When the Communists had finished packing up, I opened my Bible and began to preach. Since I am apart of the Challenge 66 program, I decided to preach the Gospel from the book of Exodus. I looked at the judgement of God upon the Egyptians, and then the Passover Lamb. From there I was able to relate that to today, and how because of our sin we deserve judgement, but Jesus Christ is the Lamb of God which takes away the sin of the world. After I finished preaching Ben stood and began to preach. He related the Biblical account of John 6, and preached on how we must partake of Christ. 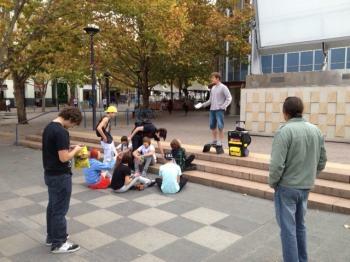 As he preached a few people stopped to listen, but overall Garema Place was quiet. Once Ben finished preaching we began to read out the Scripture. While we were doing this other members of the team showed up and they began to walk around handing out tracts and engaging people in one to one conversations. I finished off the day by reading Romans 5, and then preaching a message about how to have peace with God. Overall the day was good, a few people got to hear the Gospel and receive tracts. Please keep them in prayer. It’d been a few weeks since I was last out on the streets witnessing. With all that had been going on in my last job I just found my time was severely limited. 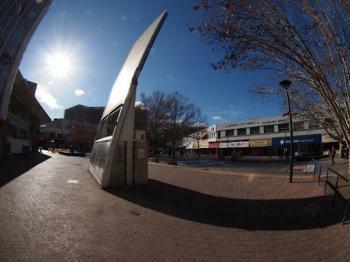 However, today that all changed, I once again was able to head into the city centre of Canberra to proclaim the Gospel. I arrived in the city at just after 9am and met up with Ben. We had a short time of prayer and fellowship before heading off to begin telling people about Jesus. The morning was fine, and the sun was putting out some warmth, so we went and stood near the bus stop and began to hand out tracts to those who were making their way to work. I tried to explain to Rosemary that her salvation is not based on who she is, or what she has done, but that salvation is dependent upon God. From there she began to talk about how she was a good person, and that must mean something. Once again I had to point out that her good works are as filthy rages (Isaiah 64:6) and that only the work of Jesus can save sinners. After hearing the Gospel Rosemary left, taking a tract saying she’d think more about what I said. Please remember to pray for her. After Rosemary left I continued to hand out the “Stop” tracts to those who were crossing the road from the bus station. As I offered one Asian man a tract, he stopped, and said, “Is this religious?” I replied by stating that it was about the Lord Jesus Christ and what He has done for sinners. This man stood there reading the tract, and then said, “I’m a Buddhist, I don’t believe this.” From there the conversation was off and running. It turns out that this man is named Wai, and he is from mainland China. Until last year Wai had been the product of atheistic communism, he believed that all religion was evil, but then he met some Buddhists who lived moral lives. He concluded that they must be right, since the Buddhists were “good people”, with that logic he converted to Buddhism, and moved to Australia. Wai told me that he was a good person at heart, and that one day he’d come back as something better in this life. So I asked him, “When you die, who will judge your deeds to determine what you come back as?” Wai looked at me blankly, and said, “I don’t know.” From there I was able to tell Him of the only true God, and how that God had given us a moral law. We walked through the commandments and Wai began to see that he wasn’t a good person, and that God would be forced to judge him. When Wai realised the depth of his depravity, I told him the good news, that God had done the only thing possible to forgive sinners, and that was to die as their substitute. It turns out that Wai had never heard the message of Jesus, he’d never heard the Gospel. 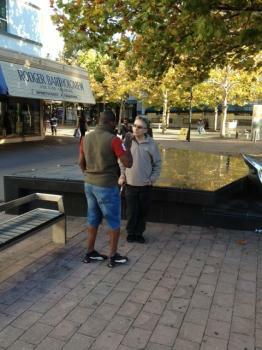 So on the streets of Canberra at around 10am in the morning Wai got to hear the good news concerning Jesus for the very first time. Our conversation finished with Wai wanting to learn more, so I gave him a tract, and a Gospel of John. Please pray that God would save Wai. Around this time Ben had returned from handing out tracts and talking to people. He’d had a few good conversations, including one with a former trainee Roman Catholic priest, who is now into new-age atheism. After sharing what we’d both encountered so far that morning we headed back into the centre of Garema Place, and there we began to declare the Scriptures aloud. People by this stage of the morning we starting to do their shopping and enjoy the sunshine, so we thought it was a good time to read God’s Word. Ben began by reading out Psalm 103. As he read a few people stopped to listen, and then moved on. When he finished reading I stood up and began to read out John 3. As I was reading I noticed again that a few people stopped to listen to the Scripture. During my reading a man named Tim walked by, stopped, listened, and then went to Ben to ask more questions. Ben was able to share with him the good news about Jesus. God was blessing the reading of His Word! After Ben finished witnessing to Tim we thought it’d be good to read a larger chunk of Scripture, so we decided to read all of 1 John. Ben began by reading 1 John 1, and then he handed it over to me for me to finish the book. As we read we noticed that people were stopping and listening. Some were even sitting down to listen, others were standing drinking their coffee while listening to God’s Word be read. There were a wide variety of people listening, from men in suits to teenagers in street clothes. Different nationalities and cultures were present also, all listening to God’s Word. Some stayed for a chapter or two, others stayed for the whole thing. God was blessing the reading of His Scripture. Now from a pragmatic position we’d done everything wrong. We are constantly told in evangelism that we shouldn’t open air preach, and if we do, then we shouldn’t use our Bible as that may turn people off, but if we do use our Bible make sure it’s anything but the Authorised Version (KJV). Well, we broke all those pragmatic rules. We open-air preached, we used Bibles and we read from the Authorised Version. Yet, as we did so you could hear people saying “Oh, he’s reading from the Bible.” The language of the Authorised Version seemed to be helping us, as when people heard the “Ye”, “Thou” etc, they knew it was the Scripture, and not some other book. After reading seven chapters of the Bible we decided to start open-air preaching. Ben went first and he did a wonderful job in lifting the Saviour high, and laying the sinner low. While he was preaching two workmen walked path laughing and mocking the Gospel. Ben on seeing this addressed them and pointing out Christ died for sinners (including mockers), they fell silent as they walked away. Around 11:30am, it was my turn to preach. It’d been awhile since I have open-air preached so I sent out a tweet requesting prayer from my brothers and sisters in Christ. As I thought about what to preach I thought I should address the question of “If there is a God, why doesn’t He do something about evil?” This question is very common to those who would seek to reject Christianity. I began preaching by stating the question, and then I went on to read Genesis 6:5-8, pointing out that God does deal with evil, but the problem is, we are the evil ones. A good size crowd gathered as I preached, and there were no hecklers. You can listen to the audio of my open-air below. After I finished preaching I was approached by young lady who had been listening to the whole message. Her name was Oonah (Irish background). She disagreed with what I said, and found the concept of surrendering and being a slave to God as repulsive. I explained to her that I was happily a slave to my master the Lord Jesus, and then pointed out that she was a slave also, a slave to sin. The moment we started to deal with the absolutes of morality Oonah showed her postmodern mindset. Nothing became right, and nothing became wrong. All morality and truth was subjective. All I could do was keep replying “This is what God says.” Ultimately the reason she disagreed with the Gospel is because she loves her sin, and she doesn’t want to submit to the Lordship of Jesus Christ. That is the only reason she’d reject Jesus. After a few minutes of talking to her she said she had to leave, however, she did take a Gospel of John and the book by John Blanchard, “Ultimate Questions”. Please pray for Oonah, may God reveal that He is a kind master, and that He is absolute truth. There was a chill in the air today as we prepared to witness in Canberra, but surprisingly there were still quite a few people out and about in Garema Place. The team met at 2pm for a time of prayer, and it was great to see some new people come and join us on the street. I was particularly happy to have Chris from Goulburn Baptist Church come out and join us. He is young and very keen to share the Gospel, given some time and training I think he’ll do very well. After about thirty minutes in prayer we split up and began to engage in evangelism. 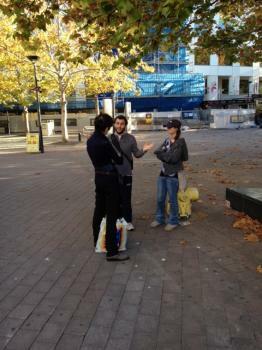 A few of us headed down the centre of Garmea Place and there we set up to begin our open air preaching. Ben was the first man up for the day. Within minutes of him beginning to preach some youth began to gather to mock the Gospel. But as with all things God was in this, and he used those young people to help draw a crowd. The group of youth sat down and listened as Ben preached. Some scorned and mocked, but others seem to be paying attention. In this situation I am not concerned if people mock the Gospel for I don’t know what is happening in their heart, while they may be putting on a “mocking face” their heart may truly be convicted. Ben preached for about thirty minutes, then it was my turn. Some of the youth stayed around and listened. One young man from the group professed himself to be an atheist, so I began to ask him questions as to why he was denying God’s existence. The young man had no answers, he simply said he didn’t believe, but didn’t know why he didn’t believe. After speaking to him I continued to preach, and I spoke on why people hate the Gospel. I shared how the Bible declares we love our sin and hate the light, and it’s for that reason we reject Jesus. As I was explaining this I heard a woman begin to yell out at me. It was the same woman from last week who screamed at me. As with last week I couldn’t understand much of what she said. She ranted and raved about this being a free country so people shouldn’t have to have a preacher stand and preach. I tried pointing out that because this is a free country that I would stand and preach, but she wasn’t having a bar of it. While these kind of hecklers are frustrating when you are trying to preach, I’ve found that God still uses them, and as this lady ranted a crowd began to build. Now all I needed was an opening to share the Gospel. Soon enough the lady stopped yelling and with that I began to talk about the Gospel to all those who would listen. Most people in the crowd stayed in order to see if the lady would start yelling again, but as long as they were there I made sure they’d hear the good news about Jesus Christ. During this time I was able to engage with a young lady named Carly, who believed herself to be not bad enough for hell, but not good enough for Heaven. We spoke for a bit about sin, and how we all need the Saviour, then as I got to the good news she turned and left. Fortunately one of the team members saw this and he was able to give her a tract and share the good news with her. I preached for about thirty minutes, and I had to deal with my heckling lady a few more times during my open air. After I finished preaching Ben got up to preach again. We chatted for a bit, but the conversation wasn’t going anywhere. We spoke about how we both wished that atheists and Christians were informed about what they believe and why they believe it, and then we began to talk about comic books (as the local comic bookshop was having a free give away). At the end of the conversation we parted on good terms, and we both said we’d chat again next time we see each other. Please pray for him. Ben preached for the rest of the day, while the rest of the team handed out tracts and had one to one conversations. Overall it was a good day, the Gospel was proclaimed and Jesus was exalted! One of the greatest joys of open air preaching (apart from sharing the Gospel), is being outside. It is great to be able to proclaim the Lord of Creation outside in the Creation. Today was one of those days where it was perfect weather, and it was a real joy to be outside proclaiming Jesus. The Lord truly blessed us with great weather for today’s outreach. When I arrived in Garema Place I noticed that the team was already there, and they were already praying for the ministry. It was great to join up with, and work alongside about 8 people who were passionate about spreading the Gospel. But what was a really encouraging was that the team was made up of different age groups. We had younger men, right up to men who would have been in their retiring years. All of which came together with the common purpose of preaching Jesus. While we were praying I happened to notice two Mormon missionaries doing their rounds. As soon as we finished our prayer meeting I excused myself and went up to the LDS elders with the purpose of sharing the Gospel. I was surprised to see that one of the elders was a man that I had spoken to on March 10, 2012. This time he wasn’t by himself, but was with another elder. The elder I had spoken to in the past seemed to now be a little bit hostile, but the other elder was friendly. I got the impression they didn’t want to talk, so I gave them a “Joseph Smith - Million Dollar Note”, they laughed and went on their way. After this I rejoined the team. From there we split up and began to go witnessing to different people. 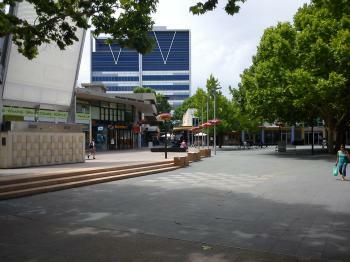 Since I was planning to preach I made my way to the centre of Garema Place and began to prepare for my open air. While I was getting ready a man came up to Jeremy and I asking if we could give him $130 so that he could buy a drum. He said he’d be prepared to sit and listen to the preaching if we would pay him. We refused to give him money, and that’s when the man became “strange”. He started talking about how if he gets a drum he’d play demonic music to stop the preaching, and then he went on to talk about how he killed Jesus, and how he has raped Jesus. I’ve spoken to this guy before so I knew he was impossible to reason with, so I all I could do was speak a few words about who Jesus is, and then he left. However, every time he walked past that day he would say something or make obscene gestures. After this, I stepped up and began to preach. My text for the today was John 3:16. Now you may be wondering, “Why would you choose that text?” Simple, everyone seems to know it, or know of it, so I thought I would use something they know of as a bridge to sharing the Gospel. Some preachers refuse to use John 3:16 in the open air as it has been abused, but I don’t think the abuse of the text is grounds to stop preaching a text of the Bible. I would rather use a Scripture that people are familiar with, and then explain that verse to them. That’s what I did in Canberra today. I started off by talking about how Australians today have no hope, but then I swung to the Gospel and spoke about the message of hope found in Jesus Christ. As I preached a few people listened, but for the most part it was quiet. But that was soon to change. While I was preaching this lady began to walk towards me yelling. At first I couldn’t make out what she was saying, but as she got closer it was plain to hear that she wanted me out of Canberra. While some people would see this lady as a hinderance to the Gospel, I saw her as a blessing to the open air meeting, as by her yelling the crowd began to grow. God used what Satan meant for evil, for good. God was using the heckling to grow the crowd. The woman ranted for a bit about how I shouldn’t be preaching in Garema Place, then she walked off. As she walked off I spoke about why people hate the Gospel. This in turn brought more hecklers to the forefront. Two homosexual men began to mock God, and even openly bragged about mocking God. Then in front of the crowd they began to kiss. When homosexuals kiss in front of an open air preacher, it is normally done for shock value. But in reality, most preachers have seen it all before, so it isn’t that “shocking” to us. We just use it as a tool to share the Gospel all the more. And, God once again showed Himself as being sovereign by using their actions to grow the crowd to hear the Gospel. Around this point I put a challenge to the crowd to see if there were any good people listening. One young man named Jack replied that he was a good person. I began to engage Jack with the Ten Commandments, and I must say, Jack was very open to listening. He would answer, then nod in agreement as I shared the Scripture. The crowd was also listening to the Law, and the Gospel. After walking Jack through the Law, I explained the Gospel to Him. I pointed out that Jesus is kind towards sinners, and that He died in the place of guilty criminals. But, I didn’t leave the Gospel there, I told him of the resurrection also. Once I finished explaining the Gospel to Jack, I asked if he had any questions. He did, and he asked them. They focused around “Science disproving God” and “What about rapists etc, will God forgive them?” I answered his questions, and called on him to worry about his own sin, and to trust in Christ. I then turned back to the crowd and called on them also to trust in Christ, to repent and believe on the Lord Jesus. With that, I finished my open air and stood down. But God wasn’t finished yet. All around the team was having one to one conversations. People in the crowd took tracts, and were wanting to talk. One young lady came up to me and began to ask me questions about homosexuality. I answered her by explaining to her that it was a sin, but then I went on to talk about Jesus being the friend of sinners. Some of her friend had joined us by this stage and they were asking questions as well. I spent some time answering their objections and explaining the Gospel to them. They all took tracts and left. After this Ben began to preach, and as he did I noticed that there were still many conversations being had. I was later told that one lady from Belgium stopped, and she was shocked to see open air preaching as she believed that Australians were laid back. Jeremy was able to share the Gospel with her for a good time. I was also told that one black African man stopped to listen to the Gospel. He said that he had been searching for truth, and that he wanted to know who God is. He said that when he heard the preaching he had to stop and listen, stating that it made sense to him. He was very grateful that the Gospel was proclaimed. One of the team members spent ages sharing Jesus with Him, and calling on him to trust in Christ. Overall the day was awesome! God showed Himself as great by allowing His Gospel to go forth. Please pray for all those who heard the good news of salvation. “CHINA, CHINA, FREE TIBET, FREE TIBET! !” They were the cries I was met with as I crossed the road and entered into Garema Place. In front of me I could see the brightly coloured flag of Tibet, and the large signs of the protesters. “China OUT: FREEDOM” seemed to be the cry on everyone’s lips, and as I made my way to the merry-go-round I couldn’t help but think that the freedom theydesire is not the freedom they so desperately need. The Tibetan protesters were after a temporal freedom, but they were completely unaware of the eternal freedom they lacked, and that they would need in the years to come. As I walked I mediated on the John 8:34-36, “Jesus answered them, “Truly, truly, I say to you, everyone who practices sin is a slave to sin. The slave does not remain in the house forever; the son remains forever. So if the Son sets you free, you will be free indeed.” (ESV), My prayer for today was that God would be abundantly kind to sinners, and grant them freedom in Jesus. As I neared the merry-go-round, I was met by Ji. It was good to see that I wasn’t going to be the only one out witnessing today. Since we didn’t know if anyone else was coming we decided to wait and watch a busker paint for a bit. To my surprise this busker was familiar to me, he was a heckler of mine from Brisbane. It was good to see him, although it was sad to see that he was still very much unconverted. After waiting for a time we decided that it was time to head off and do some walk up witnessing. It was just the two of us today, so we decided to stick together. Ji soon approach a couple of young people who sitting where the Tibetan protesters had been, handed them a tract, but it soon became very clear they weren’t interested in talking, so we made our way to another man, whom Ji managed to get into a good conversation with. As Ji witnessed to this man, I decided to hand out a few tracts. Not many people took tracts, and there seemed to be a real apathy to anyone wanting to do anything, I looked around Garema Place to see if I could spot someone to witness to. It was then that I spotted a man about 150 metres away, he was dressed in black trousers, white shirt and was wearing a tie, this immediately triggered something in my brain, my first thought was, “This is a Mormon missionary trying to deceive people”, as I watched him a bit more, I noticed the black name tag on his pocket, this confirmed my suspicion, so I made my way towards him in order to engage him in conversation. When I neared the Mormon missionary, he turned and began to walk away at pace. As he walked away he would go up to people, try to force something in their hand, then walk away quickly. This he did for about 700 metres. Finally, I was able to catch him up, and as he approached me I greeted him, and began a conversation. The missionary was friendly, and very young. We began by chatting about general things, such as the weather, Canberra and where he was from. It turns out that this white Mormon missionary was from mainland China, and for 18 months he had been in Australia on mission. We spoke briefly about persecution of religious groups in China, and he said that the Latter-Day Saints were persecuted as they refused to proselytize. The conversation then swung to the spiritual and we began to discuss the person of Jesus. I informed Elder Y---- that I was a Baptist minister, and that I was interested in learning what he believed, so we sat down on a park bench and he began to explain to me what the Latter-Day Saints teach. For about five minutes he spoke, reciting from memory the Mormon doctrine that I had heard so many times from different missionaries. He spoke about how they believed God had restored the only true church through Joseph Smith, and how once you die you have a chance to be forgiven if you would accept Joseph Smith as a prophet and believe the Book of Mormon. He then went on to talk about the nature of God, and it was during this time that he began to “attack” the doctrines that the Christian church holds to. He questioned the Trinity and stated that the concept was false, and how the Mormons knew that God had a body, as did Jesus. It was at this point I stopped him, and asked him to explain to me what he thought the doctrine of the Trinity was. Elder Y---- paused at this, he wasn’t quite sure what Christians believed in relation to the Trinity, all he had been told was that we were wrong. We then moved on to a different topic, and this was the topic of Jesus Christ, who He is, and what He has done for sinners. Elder Y---- declared that to be saved we must, “1) Have faith in Jesus; 2) Repent; 3) Be Baptized; 4) Receive the gift of the Holy Ghost; 5) Endure to the end.” These five steps according to Mormonism was all anyone has to do in order to be forgiven. This statement didn’t surprise me, as all Elder Y---- was doing was saying what the Book of Mormon says in 2 Nephi 25:23, "For we labor diligently to write, to persuade our children, and also our brethren, to believe in Christ, and to be reconciled to God; for we know that it is by grace that we are saved, after all we can do." As he read it, I asked how both statements can be true, how can 2 Nephi be right, if Ephesians 2 is correct? Elder Y---- got out his notepad and pen, and began to write the verses down. I then encourage him to look at Titus 3:5, Romans 5:1 and all of Romans 4 to see that salvation is a gift from God. When I said, “Salvation is a gift from God”, he replied, “Yes, but we must repent, that is a work!” So I took him to 2 Timothy 2:25 and showed him that repentance is a gift from God also. From this point I was able to explain to Elder Y---- that the Gospel was all of grace. I showed him from the Scriptures that we had sinned, I pointed to our judgement, then I pointed to Jesus who died for the sins of His people. I then went on to talk about 2 Corinthians 5:21 and how by the work of Jesus we are counted as perfectly righteous, that we have His righteousness imputed to us, as a result, we don’t have to work to make ourselves right, as in the eyes of God we are perfect in Christ. Elder Y---- looked stunned, he said, “I don’t know, are you sure, the Book of Mormon contradicts the Bible?” I informed him I was sure, and said, “If I can show you contradictions would you agree the Book of Mormon is wrong, and it isn’t God’s Word?” Elder Y---- replied by saying if there were contradictions then clearly the Book of Mormon couldn’t be God’s Word. So I asked him, “Where was Jesus born?” Elder Y---- replied, “I don’t know.” To which I said, “Do you know where the Book of Mormon says Jesus was born?” Again, he stated he didn’t know. “Where was Jesus born?” I asked, “Jerusalem” came the reply. At this he said he had to go, but asked if he could have my number to call me. I gave him my number, and also a in-depth tract explaining the Gospel. Please pray for him that God would open his blind eyes and allow him to see Jesus. After this I made my way back to Garema Place, and found that Ji was still witnessing. The rest of the afternoon was spent with us talking to people about Jesus, and the day finished with a discussion with a Jehovah Witness who was out handing out material. He had very little knowledge of what they believed, and even admitted to not believing it. I challenged him from the Scripture that Jesus is God, and He is to be worshipped and adored. I explained to him the Gospel, but this man flatly rejected it, and desired to stay in the error of the Watchtower. Please pray for him also. Since moving to Goulburn from Brisbane a few months ago, I have been looking for an opportunity to start a new Operation 513 evangelism team. And now it appears as if that opportunity has arisen. Being located in Goulburn (as the pastor of Goulburn Baptist Church), I have found myself strategically located just 50 minutes from the nation’s capital – Canberra. I have heard many stories about evangelism in Canberra, and the hardness of the people, and I am able to report that the accounts I have heard are true. The people in Canberra seem to be very hardened towards the Gospel. Yet, in their hardness I find hope, since Jesus Christ came to save sinners, and those who have hardened their hearts to Him are among the biggest sinners around. After spending some time trying to figure out when it would be best for evangelism we settled on planning a weekly outreach on Saturday afternoons from 2pm-4pm in Garema Place in Civic (Canberra CBD). On July 9th was the first afternoon of the outreach, and amongst the hardness we did find some people who were more than willing to take tracts, talk to use about the Gospel and even to listen to us open air preach. I arrived in Civic at 2pm and was soon joined by Merhawi who is a part of the Westminster Presbyterians in Canberra. He’d been witnessing in this part of Canberra before so I valued his wisdom and insight on the best spots to witness. As we began to hand out tracts our eyes were drawn to a large group of black African wearing white shirts. This group was handing out some kind of literature, and were walking around with TV quality video cameras and microphones. Deciding that this looked interesting, we made our way to one man and asked what was happening. Turns out this group was a new Pentecostal church plant in Canberra, and what they were doing was handing out a devotional written by their apostle (warning bells) in Texas. They provided me with a copy of the devotional and then asked me to smile to the camera and thank this apostle. I refused, gave the man a tract and then proceeded to walk off. Shortly after this we ran into another group of people from this same church, so I decided to quiz them on the Gospel. As I spoke to them I was very surprised that they were solid on this front. They explained to me the need of salvation, the cross, repentance and faith. Although their church is on the dodgy side with Apostles (dodgy cause Apostles have ceased), they had the gospel correct. We handed the group some tracts and then continued to walk around Civic handing out tracts. As we were walking I handed a tract to a man who was walking around with a football, he seemed interested in talking, so we engaged him with the Gospel. It turns out that this man’s name is Mick, and he considered himself to be an ‘in-between good person’, although he had just admitted to robbing a lady around the corner! He was hard to witness to, as he seemed to be under the influence of alcohol, but I preserved, made sure he understood sin, and then understood who Jesus is. Mick took a tract, thanked us and then walked away. My prayer is that God would save yet another drunk and transform his life. As we continued to walk around Garema Place in Civic, we noticed a young Asian man handing out books, so we walked up to him and asked what he was up to. It turns out this man was a part of an Eastern mystic religion, and he was handing out books about what his “master” had taught. The books focus was how if we all eat vegan, then global warming would cease. We spoke to him for a bit about his beliefs, it turns out that he believes that all religious roads to lead to paradise, and that we will be reincarnated. He went on to explain that reincarnation teaches that we will be judged for our good deeds and bad deeds, then depending on how much karma we have, will determine what we come back to earth as. Upon hearing this I asked Lang (the Eastern mystic) who it was that actually did the judging when we die, who determines if we have done enough good or bad. He paused for a moment then said, “We judge ourselves, our true selves will determine that.” To which I replied, “But most men will proclaim their own goodness, so surely we will all judge ourselves good and come back as humans.” Lang disagreed, and said that we all judge ourselves correctly, and we can trust our judgements. So I asked Lang, “Have you ever been wrong about something?” To which he admitted he had, so I followed up by asking, “How can you trust your judgements then? How do you know that you are correct concerning reincarnation?” Lang went on to try and explain how we can’t really know anything in and of ourselves, but rather we need an outside source to tell us. I asked what that outside source was, and he said it was his master. She was always right, so we can trust her, as she is a religious leader just like Jesus and Muhammad. The conversation then went down the path of all religions being the same, so I started to talk about ‘Master’ Jesus and how His teachings make Him unique. I showed him that Jesus claimed to be the only way of salvation, and if that is true, then all religions aren’t the same. Lang didn’t believe us, and insisted that all masters are equal. We presented the gospel to him, and I left him with a tract explaining who Jesus is. Please remember Lang in your prayers. May Jesus save him and deliver him out of the kingdom of darkness. After this I managed to get a quick conversation with Curtis, who wasn’t sure where he was going. He didn’t seem very interested but still took a tract. May Jesus save him. As the day drew towards an end, we decided it would be good to open air preach. 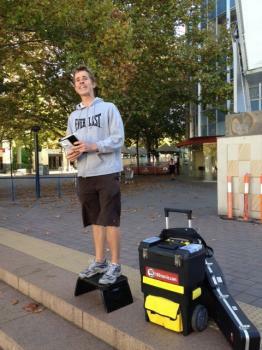 So I set up my box in Garema place and began to preach on the frailty of human life. A few people stopped (probably 20-30) and a few hecklers emerged. One man claimed to be a Christian and he had a go at me for preaching from the Old Testament, so I went to the New Testament to prove what I was saying. This man then made the claim, “Jesus died so I can live in sin.” That was a statement I had to go after. I took him to 1 John and explained that if we live in sin, then it shows we aren’t of God, but rather we are of the devil. This seemed to quiet him down for a bit. The next heckler that came along decided to yell abuse at me and swear at me for “telling people my opinions in public”, he said no-one should shout their opinions. I pointed out he was being a hypocrite, as it was his opinion that no one should shout their opinion. He swore and walked off. The next heckler decided he would try and drown out the preaching by taking off his shirt (in freezing temperatures), put on a wig and play the saxophone really loudly. I used this distraction to explain how people love their sin and hate Jesus, and that they will do anything to silence the gospel. A few people stayed to listen to the end. At about 4:30pm, I finished up and we headed home. Praise God for a good first day. May the ground in Canberra be ploughed up and may the seed of the Gospel take root.